It’s an old joke of mine that when it comes to Cadenhead, they produce great rums and confusing letter combos. To use this one as an example, the label might lead more to head-scratching confusion than actual enlightenment (for nerd or neophyte alike) but a little background research can ferret out the basic details fairly well when it comes to Guyanese rums. 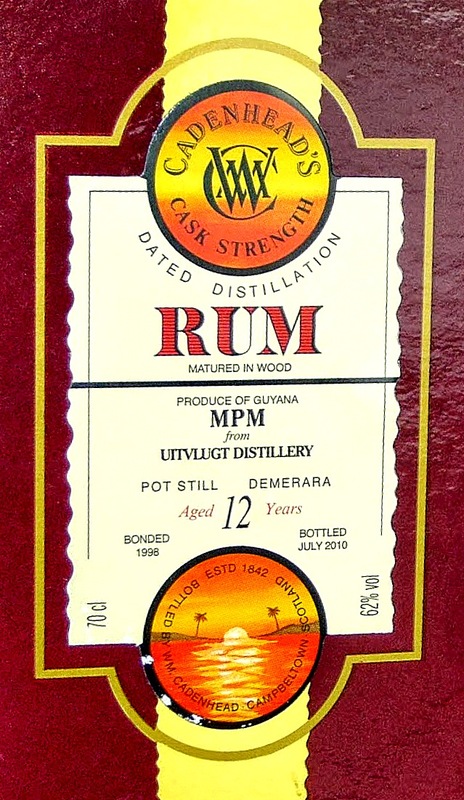 In this instance, the “MPM” moniker probably stands for Main Port Mourant or some variation thereof – the key fact it purports to convey is that the rum within is from a pot still rum from there, which any devoted mudland rum-lover would then be able to recognize. The Port Mourant double wooden pot still started life in Port Mourant in Berbice, then got moved to Albion as part of Booker’s consolidation strategy in the 1950s; when the Albion distillery itself was shuttered in the sixties, the stills went to Uitvlugt estate, where all subsequent PM rums were made until 1999. At that point DDL shifted the stills to Diamond estate on the Demerara river, where they currently reside. If nothing else, it makes deciphering the “Uitvlugt” portion of the label problematic because more than just the PM still was in operation during those decades, and the taste profile as described below is (to me) not very PM-like at all. For now, let’s just leave the historical info there (though if your curiosity has been piqued, Marco’s magnificent essay on the Guyanese estates and their marques remains the best and most comprehensive treatment ever posted and deserves a read). The technical details are as follows: golden coloured rum, 12 years old, distilled in 1998 and bottled in 2010, a massive 62% of proof – the outturn quantity is unfortunately unknown. Cadenhead, of course, has a reputation for cask strength rums issued straight out of the barrel without filtration or additives, so that’s all very positive. The MPM, unlike some tropically- matured juice of equal age, is not a particularly smoothly sedate affair to smell – a relatively young continentally aged rum of such puissance (I love that word and always wanted to use it) is a much sharper experience. Clear, blade-like aromas of paint thinner and furniture polish come out fast, alongside flowers, cereals and crushed nuts with white chocolate and almonds; soursop, green mangoes and unripe guavas (the red ones, which are more tart than the white ones). Caramel, smoke and vanilla….and very little licorice or anise or sawdust / woody scents that so characterize the PM mark. As it opens it goes more in the salty direction: vegetable soup and maggi cubes, a takeaway ramen soup flavoured with lemongrass, but fortunately this is kept very much in the background and doesn’t detract measurably from the overall aromas. Palate…yummy. Hot, sharp, deep, opening the party with the lacquer, paint and plastic of a newly refurbished house. Salt, caramel, chocolate oranges, blueberries and raisins, dates, vanilla, some oaky sharpness, not bitter at all. Although it was a bid harsh in the mid palate, it did calm down after few minutes and was really good — kinda sweet, quite drinkable within the limits of the Boss-level strength. Additional flavours of butterscotch, unsweetened chocolate, and anise were noticeable and as things moved to a conclusion, the citrus took a back seat, which kept the tart acidity under control, leading to a long and aromatic finish – there we had caramel, fruits, nuts, vanilla and tangerine rind, more a summing up than anything particularly original. For a continentally aged rum, twelve years is right on the edge of being a bit too young when bottled at this kind of strength. The ameliorating influence of the casks is not enough to tame the fierce pungency of a 62% spirit – though admittedly, some will like it for precisely that reason. This is one of those rums where a little water to bring it down would probably be a good idea. I’m not a proselytizer for tropical ageing as a general standard for Caribbean rums, but tasting a backdam beefcake rum like this one makes you understand why it’s sometimes the right thing. As a separate matter, after tasting it completely blind I wasn’t entirely convinced that it was actually a Port Mourant rum. Granted, your average rum junkie might not care – it’s pretty good, after all – but I’ve had quite a few in my time, and the profiles of the wooden stills, whether Versailles, Port Mourant or Enmore, are very distinctive, almost defined by the anise / licorice / sawdust aromas and tastes that run through them all. Here I simply did not sense much of that, leading me to wonder whether the rum is from the Uitvlugt Savalle still rather than the wooden one. For what it’s worth, Marco Freyr tried this 1998 MPM back in 2013 and he had no trouble identifying the anise/licorice notes much more concretely than I could or did: and it would be interesting to know if anyone else’s experiences parallel mine…or his. But those two points aside, the MPM is a strong and assured rum, rarely stepping wrong. It nicely showcases the dusky heaviness and solid assembly of any number of Guyanese rums issued by various independents. The nose was intense, the flavours were tasty, the arrival and departure were appropriately massive. No matter which still it hails from, no matter how young it is, and irrespective of where it was aged, it’s still a rum that will leave you breathing hard and sipping carefully, trying to identify that last biting taste from the glass. And perhaps that’s as good as we can ask for, even for a rum that’s a “mere” twelve years old. Cadenhead has issued several MPM variations, as well as some others from Uitvlugt. You can see why there’s occasional confusion with their letter labels. Single Cask Rum has tried quite a few – although not this precise one – and it’s worth a look to see what he has to say about them. Also, Marco’s 2013 review of this 1998 PM is available, in German for the curious.